To understand the power of yoga, we must first have a basic understanding of the human nervous system. First of all, what is our nervous system? Our nervous system coordinates all of our voluntary and involuntary processes in our body, it is responsible for sending signals from one part of our body to the other. The nervous system can be divided into two main categories, the central nervous system (our brain and spinal cord), as well as the peripheral nervous system. It is the autonomic nervous system (ANS), which resides as part of the peripheral nervous system, that controls our basic life functions: heart rate, digestion, breathing salivation, perspiration, pupillary dilation, micturition (urination), and sexual arousal. Educating ourselves about how our bodies work, can bring insight into how particular behaviors and activities alter its ability to function in positive and negative ways. Many people are familiar with the sympathetic and the parasympathetic nervous systems which are the two main subsets of the ANS. The sympathetic nervous system (SNS) controls our “fight or flight” response, and the parasympathetic nervous system (PNS) our “rest and digest” response. Most simply understood, our SNS is our body’s accelerator, it promotes arousal. The PNS is our brakes, it promotes calming of the nerves so they can return to regular function, as well as enhances digestion. Although our ANS is mostly below a conscious level of control, we do have the capacity to control it to a certain degree. How does Yoga and meditation affect our ANS? Yoga and meditation are conscious ways of activating our PNS. Through activation of our breath and/or through the gentle movement of salutations, they help us to relax and bring attention to our bodies. This decreases stressful thoughts, and thus the release of cortisol, the body’s stress hormone. What about those intense power yoga classes? Vigorous yoga practices initially activate our SNS, and then conclude with meditation and savasana which stimulate our PNS. By preceding activation of our PNS with intense salutations, we are able to further deepen our relaxation. How is yoga different from any other exercise? It is true that most rigorous exercise can stimulate the PNS. But yoga and meditation have the added benefit of concentrating the mind. A key component of yogic teachings is “mindfulness”. Mindfulness practice trains the mind to let go of excessive thinking, and come into the present moment. An experienced yoga instructor will continually remind the class to let go of the day, and come back to right here, right now. In this way, yoga is like exercise while meditating and results in a release of anxiety and a deeper sense of ease. 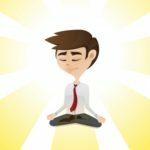 How Can I Practice Mindfulness in My Everyday Life?